I remember the day when you first came to clean for me. Spring was nearly over, ready to hand the plow to Summer. You were quiet, distant. At first, I thought you were shy, but as soon as you looked me in the eye I knew you were not. I assumed you were full of pain, but your face had no social fear. Your manners were well. You were observant, you looked me in the eyes when you answered my questions. Your eyes were full, weighed down by hidden pain. That was the only part of you that revealed your readiness to burst. You were trying so hard to restrain pain, I knew. For I had once felt the same. I wanted to help you forget the pain, but I didn’t know if you’d ever let me. I am not old, but my few years have not been kind to me. I have lost much, a husband among everything else. I’ve seen more than I wanted to. I’ve been betrayed, rejected. Dreams of mine were dashed. Life made me frail when all I ever tried to be was strong. It was hard for me to accept help, and have you clean my big house. I needed you. But as God would will it, we both needed each other more than we thought. You needed money. I needed an extra back. You worked always in my sight. I would give you a task, then do something small nearby as I watched you work. Silence was heavy. I could not break it. I would try. I would look to you, observe you steadily working. You dressed practically. On that first day you wore a faded short sleeve t-shirt, the teal color still suiting tanned skin, an old jumper that looked as if it should have been cut up and used in the place of the rag you held, and an iPod sat in your pocket, earbuds falling out and traveling up to your left ear. You never smiled, but only cleaned and listened to the music playing inside your left ear. You nodded, saying nothing for reply. You took the box from me, your earbuds touching my arm. I wondered what sort of music you listened to, what you turned on to comfort your pain. I believe that first day was long for both of us. Three hours. You did a lot of work, I had a lot that needed done. But the work was nothing; it was the silence weighed down by unspoken pain. We both managed our pain by thinking quietly, working it away. I paid you, trying to read what you silently said as you accepted the money. Your body looked tired but satisfied. You were a good, hard worker. I was pleased. I could also tell you were happy to get the money, to leave me. I suppose to you, I was old. “Thank you for your help,” I told you. After I said yes you forced a single smile and ran away. I sent a prayer after you, hoping God would help me ease the pain that obviously tormented your pretty eyes. You returned exactly on time. Not a minute too early, not a minute too late. You were dressed exactly the same as before, an earbud trailing out of your left ear, your rags draped practically, ready to clean whatever I had for you. You made my bed. You washed my dishes. You scrubbed my bathroom, not fearing any dirt but washing it all away. You wore no gloves, but your fingers dived right in. 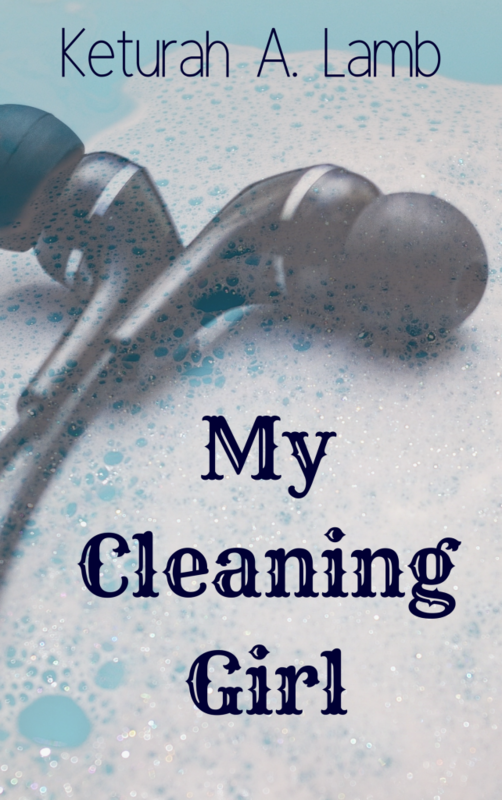 I loved watching you clean, wondering what drove you. “Tell me something about yourself.” I watched you dust my complicated, cluttered living room shelves. I was not surprised. You breathed deeply, then finish working. “What do you do for fun?” I wasn’t going to give up so easily. You pointed at your neck, so I looked. I hadn’t noticed the necklace before, as it fell hidden beneath your neckline. You pulled it out. I saw bamboo threads knotted around glass beads. Unique, mysterious, pretty. Like you. It seemed to tell a complicated story that only you could know, yet you wished others to be taunted with what it might mean. “It is pretty,” I said. Your lips parted, teeth revealing a wide smile. And that is when I thought you were beautiful. I never had a chance to wonder before. But now I knew that there was something about you, that once uncovered would be worth knowing. I could think of no more questions, and so I kept watching you, dreaming up new questions to ask you, to draw your story free. The weeks became months. Summer hit us hard with heat. I watched you heal before my eyes, wondering if it were our quiet three hours that was working transformation inside of you. Your eyes did not look ready to cry at every moment. There was a faint smile. I even felt fondness directed toward me. Busy seemed like your favorite word. We rarely talked. I would tell you of my travels, show you pictures. Once I offered you tea in my china glasses you often dusted. I could see your eyes light up as they lingered over the exquisite curves of the glass, traveling over the dainty painted flowers. You nodded, watching me pour hot liquid over the tea bag. I handed you the cup of tea. You stared at the tea in one hand to the broom in the other. I could see the turmoil inside of you as you wondered whether to clean or drink or do both at once. You obeyed with a hesitant smile, sliding onto a chair near my table. You brought your face into the steam, breathed it in deeply, your eyes closed, your lips happy. You slurped the tea slowly, just like a tea-lover should. That word, busy. I wanted details. “I have been blogging a lot. My blog seems to be growing.” You smiled, pleased. You were so quiet, but I could tell there were many words in you. Words I wished to know. I was pleased all those words weren’t staying trapped behind your pain, but that you obviously writing and sharing some of them with the world. The summer was almost over when I stumbled across the cause of your bitterness. “Do you have a boyfriend?” I’m not sure what made me ask you the question. Maybe it’s because I’m old and you’re young. You stopped cleaning. Abruptly the small smile that had been around your lips the last few weeks vanished. I almost thought I saw a small tear fall, splash toward the floor you’d just mopped. You shook your head much too quickly. And then started rapidly talking about a trip you were planning, to visit friends. You smiled. “Oh, yes! I have several very good friends. I have been blessed in that way.” Yet something in your tone showed me you didn’t feel so blessed. “I have also lost a lot of friends to stupid misunderstandings,” you added quietly. I understood the bitterness laced through that last sentence of yours. To me you were still a child, but even children can be hurt by people they thought loved them. I wished to know more, but I didn’t want to pry, to cause more hurt. So I left you alone. Your earbud fell from your left ear, clunking to the floor. You quickly picked it up, placing it back into your ear, then finished mopping. The next week you worked very fast, more so than normal. You were on fire. Or maybe you were keeping tears from falling? I remember trying to hide from pain of mine, hiding behind something real to make me forget. Your dusting was not as careful as it should have been. Your hand swept past an old bowl of mine, dear and treasured. It had belonged to my great-grandmother. Once it had been part of a larger set. This was the last piece. The bowl fell to the floor, shattering to many pieces. The shards of my grandmother’s bowl tore my eyes. I could say nothing. “Was it special?” You asked. “It was just a bowl,” I answered. But you worried about it the rest of the day, working slower, and not saying one more word until our time was up. Summer was almost over. I wondered if it was because of this you worked slower. But no, it couldn’t be. Weather wouldn’t cause you to move as if stunted by fear. The bowl had been broken two weeks ago; that couldn’t possibly be haunting you yet. Your hands trembled. You bit your lip as if you had something you wanted to tell me. “Yes.” Ah, now was the time. “Oh, I’m sorry. He must not have been the right one.” Even as I said the words I felt as if I had just pained you more. I cringed. Your eyes drew away from me, your whole body acting as if I’d wounded you. I should have known better. After my own divorce many told me similar words. And I hated them for those heartless, void words. I was no comfort… the right one left you, that is why you hurt. I am so sorry for those words I spoke. I knew better, yet I said them. I don’t think you ever said that many words to me at once before. I knew you were capable. Something in your eyes betrayed that you were full of words, full of life. You had friends… one did not have good friends from silence. You were talented. One is not talented without a mind full of life. I had been waiting so long to hear your words, but now I could think of nothing to say. Your lips twisted, your eyes filled. You were trying to not cry. “Men are horrid creatures sometimes,” I said at last. “Women are stupid idiots, too.” You replied. We laughed together, both of our cheeks wet with tears. Your eyes looked into mine, hoping for truth to push away the darkness. How I remembered being desperate for understanding! Once I, too, had wondered why as darkness claimed me and others said, “Just move on, God knows what He’s doing.” During my darkest times, only God was able to comfort me. I hoped I could be different, and truly understand you as no one had me. I sent you a smile, trying to convey comfort. “I do. Dear, you are a beautiful soul loved by God. I can’t make the pain go away. I won’t offer meaningless words. But I will say this, it’s OK to hurt. And you are stronger, more beautiful than the pain.” I know I didn’t know your details, the reasons he left you, or what you think you did. But these last months watching you, observing your pain I knew that your pain was born from a real love for him, for anyone in your life. You loved too much. And this is good. You knew how to love, and for that reason I could not think you guilty. Yes, it matters what the people we love think. Even after they betray us. I knew that hurt. I have felt it. “Maybe in time he will know what he lost.” I tried to encourage. We pick up our silence once more as you clean. You fall into the sounds of your earbud. While you cleaned the next week you told me about your stories you were writing. You asked if I might want to read one. Those words made you smile. Today you knocked on my door, a smile on your lips. I saw peace on your face. There were no earbuds in your hands. “Did you forget your music?” I asked. This day as you worked you talked a lot to me. You told me about what you were writing, about a ball of yarn you had just spun, how one of your friends had just told you she was having a baby girl. You told me how you planned to go stay with another friend once her first child was born. You told me of your plans to go to your first writer’s conference. Hope. It was winning over the darkness, the hurt. I doubted you’d ever forget your boyfriend; I still think of my husband. But what he thought would matter less and less to you. You would rise above it all confident and stronger, a beautiful smile adorned. I smiled to your words. You were healing. Your eyes still had a certain longing in them, even as your tone bounced with hope. But I was happy to see the process was going forward. You blushed, looking away. And then you forced your eyes to look into mine for a second. “I’m glad I can help.” I see a silent thank you in your eyes, as if you are grateful for me in helping you, too. “Do you need me next week?” You asked. You looked away, to the ground. I knew you wanted to come back. And it wasn’t about the money in you hands, or what we said to each other. For we rarely talked. I think there’s a peace in my home that we both relate to. We find it together as we listen to God’s silence pulling us nearer, healing us.